6351601 3FD50 TOYOTA 3FD50 Diesel forklift FD series. Spare parts catalog. Service (workshop) Manual. 6351602 5FD50 TOYOTA 5FD50 Diesel forklift FD series. Spare parts catalog. Service (workshop) Manual. 6351603 8FD50 TOYOTA 8FD50 Diesel forklift FD series. Spare parts catalog. Service (workshop) Manual. 6351604 40-3FD50 TOYOTA 40-3FD50 Diesel forklift FD series. Spare parts catalog. Service (workshop) Manual. 6351605 8FD50N TOYOTA 8FD50N Diesel forklift FD series. Spare parts catalog. Service (workshop) Manual. 6351606 40-8FD50N TOYOTA 40-8FD50N Diesel forklift FD series. Spare parts catalog. Service (workshop) Manual. 6351607 8FD50U TOYOTA 8FD50U Diesel forklift FD series. Spare parts catalog. Service (workshop) Manual. 6351608 3FD60 TOYOTA 3FD60 Diesel forklift FD series. Spare parts catalog. Service (workshop) Manual. 6351609 5FD60 TOYOTA 5FD60 Diesel forklift FD series. Spare parts catalog. Service (workshop) Manual. 6351610 8FD60 TOYOTA 8FD60 Diesel forklift FD series. Spare parts catalog. Service (workshop) Manual. 6351611 40-3FD60 TOYOTA 40-3FD60 Diesel forklift FD series. Spare parts catalog. Service (workshop) Manual. 6351612 20-5FD60 TOYOTA 20-5FD60 Diesel forklift FD series. Spare parts catalog. Service (workshop) Manual. 6351613 50-5FD60 TOYOTA 50-5FD60 Diesel forklift FD series. Spare parts catalog. Service (workshop) Manual. 6351614 8FD60N TOYOTA 8FD60N Diesel forklift FD series. Spare parts catalog. Service (workshop) Manual. 6351615 40-8FD60N TOYOTA 40-8FD60N Diesel forklift FD series. Spare parts catalog. Service (workshop) Manual. 6351616 8FD60U TOYOTA 8FD60U Diesel forklift FD series. Spare parts catalog. Service (workshop) Manual. 6351617 FD70 TOYOTA FD70 Diesel forklift FD series. Spare parts catalog. Service (workshop) Manual. 6351618 5FD70 TOYOTA 5FD70 Diesel forklift FD series. Spare parts catalog. Service (workshop) Manual. 6351619 8FD70 TOYOTA 8FD70 Diesel forklift FD series. Spare parts catalog. Service (workshop) Manual. 6351620 20-5FD70 TOYOTA 20-5FD70 Diesel forklift FD series. Spare parts catalog. Service (workshop) Manual. 6351621 50-5FD70 TOYOTA 50-5FD70 Diesel forklift FD series. Spare parts catalog. Service (workshop) Manual. 6351622 8FD70N TOYOTA 8FD70N Diesel forklift FD series. Spare parts catalog. Service (workshop) Manual. 6351623 40-8FD70N TOYOTA 40-8FD70N Diesel forklift FD series. Spare parts catalog. Service (workshop) Manual. 6351624 8FD70U TOYOTA 8FD70U Diesel forklift FD series. Spare parts catalog. Service (workshop) Manual. 6351625 3FD80 TOYOTA 3FD80 Diesel forklift FD series. Spare parts catalog. Service (workshop) Manual. 6351626 5FD80 TOYOTA 5FD80 Diesel forklift FD series. Spare parts catalog. Service (workshop) Manual. 6351627 8FD80 TOYOTA 8FD80 Diesel forklift FD series. Spare parts catalog. Service (workshop) Manual. 6351628 60-5FD80 TOYOTA 60-5FD80 Diesel forklift FD series. Spare parts catalog. Service (workshop) Manual. 6351629 8FD80N TOYOTA 8FD80N Diesel forklift FD series. Spare parts catalog. Service (workshop) Manual. 6351630 40-8FD80N TOYOTA 40-8FD80N Diesel forklift FD series. Spare parts catalog. Service (workshop) Manual. 6351631 8FD80U TOYOTA 8FD80U Diesel forklift FD series. Spare parts catalog. Service (workshop) Manual. 6351633 5FDA50 TOYOTA 5FDA50 Diesel forklift FDA series. Spare parts catalog. Service (workshop) Manual. 6351634 02-6FDA50 TOYOTA 02-6FDA50 Diesel forklift FDA series. Spare parts catalog. Service (workshop) Manual. 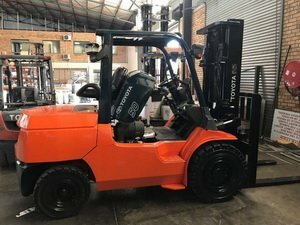 6351635 02-7FDA50 TOYOTA 02-7FDA50 Diesel forklift FDA series. Spare parts catalog. Service (workshop) Manual. 6351636 42-7FDA50 TOYOTA 42-7FDA50 Diesel forklift FDA series. Spare parts catalog. Service (workshop) Manual. 6351638 7FDAU50 TOYOTA 7FDAU50 Diesel forklift FDAU series. Spare parts catalog. Service (workshop) Manual. 6351639 02-6FDAU50 TOYOTA 02-6FDAU50 Diesel forklift FDAU series. Spare parts catalog. Service (workshop) Manual. 6351641 3FDE60 TOYOTA 3FDE60 Diesel forklift FDE series. Spare parts catalog. Service (workshop) Manual. 6351642 3FDE70 TOYOTA 3FDE70 Diesel forklift FDE series. Spare parts catalog. Service (workshop) Manual. 6351644 5FDM60 TOYOTA 5FDM60 Diesel forklift FDM series. Spare parts catalog. Service (workshop) Manual. 6351645 5FDM70 TOYOTA 5FDM70 Diesel forklift FDM series. Spare parts catalog. Service (workshop) Manual. 6351647 5FDN50 TOYOTA 5FDN50 Diesel forklift FDN series. Spare parts catalog. Service (workshop) Manual. 6351648 5FDN60 TOYOTA 5FDN60 Diesel forklift FDN series. Spare parts catalog. Service (workshop) Manual. 6351650 7FDU60 TOYOTA 7FDU60 Diesel forklift FDU series. Spare parts catalog. Service (workshop) Manual. 6351651 7FDU70 TOYOTA 7FDU70 Diesel forklift FDU series. Spare parts catalog. Service (workshop) Manual. 6351652 7FDU80 TOYOTA 7FDU80 Diesel forklift FDU series. Spare parts catalog. Service (workshop) Manual.